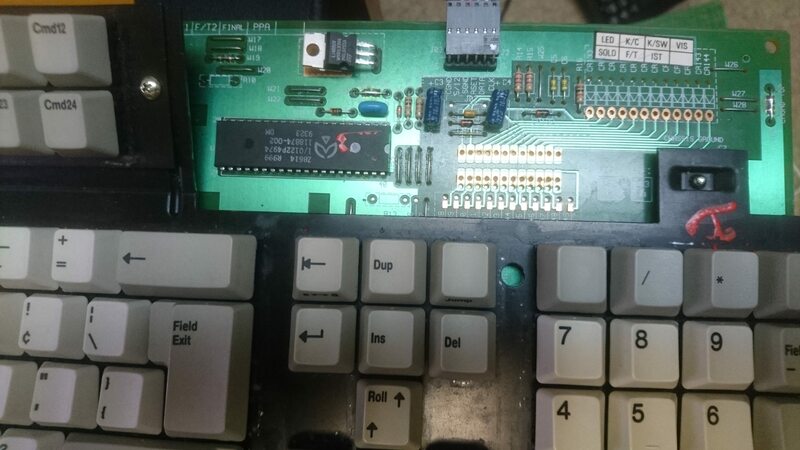 A long time ago I bought a PC122 that was in great shape from Cindy and well it didn't work.... Well after some research and help from Engicoder, it was determined that the board needed a higher voltage(9v) and that it might not be speaking XT but rather a different form of XT. Bummed that I would need a custom converter and that the board might not even speak the right protocol I put the project aside for a while. Then one day I saw that there was another NMB PC122 for sale on ebay and it was a buy it now option so I grabbed it. This one was PS2 based and therefore works with modern PCs. This had me thinking that there might be a possibility that a controller swap might work if the PCB was the same. Now I knew that there is many different versions of this keyboard but the PCB layout was basically the same. Well I got the board home and well the revision number was the same! Rev.C-1. Sweet this looks like it's going to work! The first thing that I did was remove the voltage regulator from the original board since the second one didn't have one. This unfortunately didn't do anything. I was wondering if the voltage now that the regulator was removed would be enough for the Zilog controller to work. But...... That didn't seem to work. I checked the voltage that was going to the controller and it was below the minimum requirement for the IC controller to operate. Well it looked like I was out of luck for a while until I could full compare both PCBs. So that's what I did.... I desoldered all of the switches on both boards so that I could fully compare them and make sure that my idea of swapping the controller was going to work. After further investigation it only needed a couple of jumpers, a diode and a new controller which I still don't have a place to source them at the time. Then I began looking for the following controller NMB PC122AT1486 and came across may IC selling sites that looked like they were made in the 90's. Having to sign up and place an order of 1 chip was interesting. The amount of emails that you get back was a lot more than I was thinking. Sorry but that chip is no longer in production and we don't have a source for it. Nice day!I have check the part PC122AT1486.It is exactly the same as your photo. But the part is refurbish.Can you accept? Hell yeah! I will accept it, since this was the only offer that I got in a month. Well two days later it showed up at my door! Now came the tricky part, making sure that I didn't blow up the roughly $38 usd chip after shipping. I studied the PS2 NMB PC122 board for a good amount of time before attempting the swap. I had to make sure that all of the jumpers that the PS2 PCB had were copied over to the old XT PCB. Afterwards came the installation of the diode and the main controller. In order to test the swap I plugged the newly converted XT now AT board in with the other's cable into a Soarer's converter. Well who would have guess it showed up as AT/ps2. Now that's a good sign and then wanted to do the ultimate test which is soldering a switch in the board and seeing if that works. Well looks like another success! Note: If anyone needs to do this conversion I can get you the contact information of the supplier of the chips as of when I placed my order they still had over 16+ chips in stock. I know that this was a lengthy post thanks for reading to the end. Last edited by TheInverseKey on 03 Feb 2019, 00:06, edited 1 time in total. Great work and excellent write up! Who would of thought you could find the controller chips for sale. I desoldered all of the switches on both boards. Whoa! Those switches are a nightmare to work with! I once bought one of these as a donor for switches and caps but it was so beautiful and nice that I couldn't bear to harm it. Wow, that's quite the restoration you did there! Nice! Yes these boards really test your desoldering skills but I think that they are some of the easiest switches to desolder and remove.